As a Wedding Planner my clients are always asking me about ways they can honor their guests if they are traveling. The answer is usually Goodies Bags left at the Hotels the guests are staying at. As someone who has also been on the other side and received a bag upon check-in it’s really appreciated and quite a treat….I mean who doesn’t like to come back to the hotel room and maybe after a few cocktails have a little midnight snack? But one of the hardest parts is figuring out what to put in those bags…and how to possibly package them…and maybe a novel little trinket that your guests will remember their visit to a specific area. Well…Sara’s Gracious Goodies takes all the guessing work out of this detail for brides. Not only does she couple great snacks & beverages together…but she also does themed bags that can represent a great city such as New York (and it’s not because this is where I’m from & reside)…or a winter wedding! And don’t think it’s just snacks that you’ll get in these goodie packages…one of my favorite ones is the NYC Treat, which includes 2 Lil Poland Spring Waters , Weekly edition of NY Magazine , NYC Traffic Treats, I LOVE NY Chocolates, Large Black and White Cookie , Kettle Korn Popcorn from The Hampton Popcorn Factory & Chocolate Chip Cookies from Tates Bakery…And they can be packaged inside your choice of a Map Tote (Queens, Bronx, NYC, Manhattan or Brooklyn)…How much more NYC can you get!? Fabulous and your guests will absolutely love it! Her ideas bring a little more of a high end quality & representation to the classic hotel guest bag. 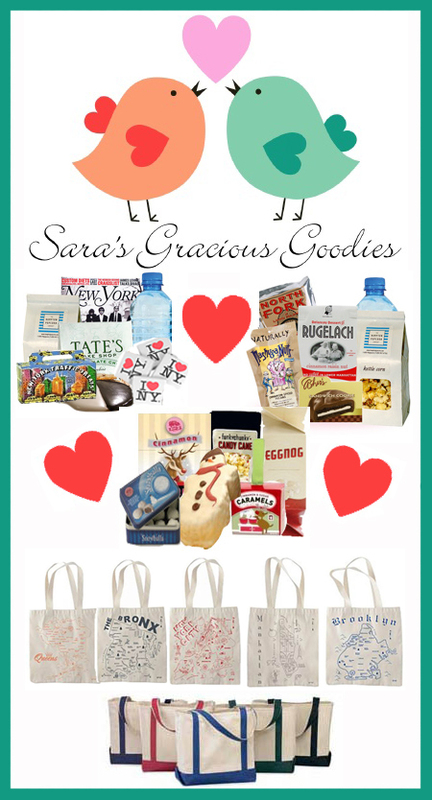 Prices for the goodies range from $10 – $38 per package & then $10 per tote. However, if you don’t want to pay for the tote, atleast you can purchase the goodies and go with a less expensive route of a colorful paper bag from PaperMart (a great wholesale priced supplies store). Great find…and great bargain…without the hassle! I admit, I have not been on this webpage in a long time… anyhow it was another enjoy to see It is such important case and to avoided by so many, even proficient. I thank you to help making people more awake of possible issues. thanks for the tips – these are great finds! what a wonderful concept, i can’t imagine any guest that wouldn’t enjoy a thoughtful little surprise like that.